I first heard about Iliana Regan nearly 4 years ago when her underground restaurant, One Sister Inc., was discounted on some groupon-like website. Though I missed the deal, the idea sounded intriguing enough to warrant a visit. What I experienced was a meal like no other I ever had which I documented here on LTH. A little over a year later, Iliana opened her restaurant, Elizabeth, to critical (and LTHForum) acclaim in a small space on Western Avenue with communal tables. Utilizing the same techniques that she did in her own kitchen, Iliana prepared 3 different menus consisting of her foraged foods and innovative techniques. She has since done away with communal tables, and is now offering one menu at a variable price. Gonzo70 wrote: In my opinion Elizabeth is already one of Chicago's best and most interesting dining experiences. Darren72 wrote: The meal was excellent, fun, exciting, and delicious! Worth every penny we paid and more. Bspar wrote: I am still coming down from my meal last night at Elizabeth. turkob wrote: I made it to Elizabeth a couple days ago and I thoroughly enjoyed the experience. gastro gnome wrote: This was one fantastic meal. Great nomination; I have been dining at Eizabeth regularly since the opening and it has been a pleasure watching the venue evolve and Chef Regan steadily improve and take a restaurant that was amazing from day one to an even higher level. Dining here is always a fun, whimsical experience with interesting, well prepared food and hospitality to match. PopcornMegaphone wrote: For me it's the Deer Menu at Elizabeth. In May I discovered their facebook page was offering discounted same day tickets and on a lark my wife and I decided to go. Best decision ever. For the past few years the majority of my fine dining budget as been devoted to the what has been become a comparatively soulless exercise: Next. In contrast my visit at Elizabeth was warm, personal, distinctive, and yes, delicious. It was a meal that reminded me why I love true chef driven restaurants. Elizabeth is a wonderful fine dining restaurant that feels like a neighborhood gem. That's not easy to pull off, but somehow they do it. PopcornMegaphone wrote: Elizabeth is a wonderful fine dining restaurant that feels like a neighborhood gem. That's not easy to pull off, but somehow they do it. Exactly what I was going to write! +1 for Elizabeth as a GNR--I haven't been in a while (too many restaurants, too little time) but hope to fix that soon! Elizabeth is exactly the kind of fine dining restaurant that feels like a GNR. Of course the food is top notch and the creativity and dedication from the kitchen are evident in everything they do. But the experience at Elizabeth extends beyond that. Iliana Regan insists on over delivering at every step of the process. Whether she's foraging for the ingredients herself, offering multiple tasting menus on the same night (something she mercifully discontinued because it was too much for any kitchen to handle), or selling $65 seats on week nights, Elizabeth is the fine dining restaurant that is least afraid of trying something different and doing whatever it takes to make it happen. They sell tickets but if you call them with enough advance notice they'll exchange them with no hassle. Recently they've started offering doughtnuts on Sunday mornings and they're even planning a Game of Thrones theme meal in April. I just love so much about what they're doing. I support Elzabeth as a GNR. Elizabeth for GNR, yes Absolutely! 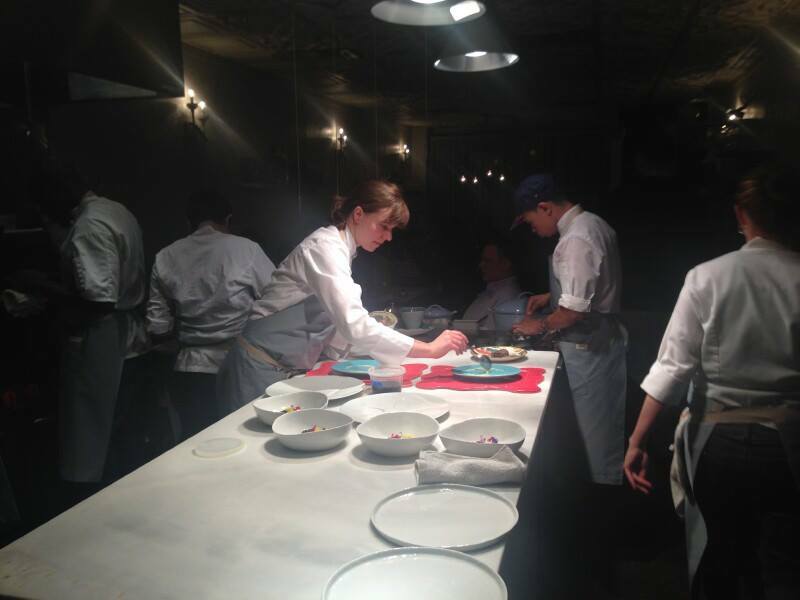 I have deep respect for Iliana Regan and consider Elizabeth one of my favorite restaurants. Elizabeth, Count me a Fan! Elizabeth - Not a GNR to me. You can make reservations over the phone at Elizabeth. I cant support a fine dining spot for a GNR - not what I think the list is supposed to be about. a little discussion has never hurt anyone, id prefer some dissent vs rubber stamping every nominee. Last edited by jimswside on March 13th, 2015, 11:09 am, edited 3 times in total. I tend to agree that the higher end places need to be extra special--not just a great restaurant because, at least theoretically, all higher end places should be pretty great. But in the case of the ones that we have included, like El Ideas and, hopefully, Elizabeth, there are special things about them that make them a deserving component of our GNR program. In the case of Elizabeth, it's the very unique way that Iliana Regan approaches what she does--the intimacy of the food, the incredibly personal nature of what she wants the guest to experience and how much that has connected with members of our community. I feel like if I wanted to recommend a GNR-like place at the higher end of the spectrum, and a lot of us do want that, Elizabeth is one of a very select few that I could feel 100% comfortable with. Elizabeth as a GNR feels like a natural fit to me and I fully endorse this nomination. Yes, it can be relatively pricey but I'm not even sure it's accurate to describe it as fine dining. That's a bit of a pigeonhole. If it is fine dining, it's certainly street-level fine dining because the vibe at Elizabeth is decidedly casual and informal, and eating there is fun. What happens on the plates (and stones and inside the test tubes and atop the patches of grass, etc.) at Elizabeth makes it one of the most distinctive places - if not the most distinctive place -- in Chicagoland. The stories behind the food are important and clearly reflect Chef Regan's personal journey and philosophy. They are not just random gimmicks but vignettes; almost like pages from her diary communicated in culinary form. She cares immensely about what she's doing and she puts herself out there in a way that many other chefs would never even think to. And she's been doing it (previously at One Sister) since before Elizabeth even existed. Through that entire time, our community has been ovewhelmingly receptive to her work. Eating at Elizabeth isn't 'getting your grub on' -- a term I use often and also something I love to do -- but that doesn't make it any less deserving of being a GNR.